The modak symbolises the happiness and joy a seeker derives from spiritual pursuit. The sweet filling inside a modak is made up of fresh grated coconut, jaggery, and spices, while the soft shell is made from or wheat flour mixed with khava or maida flour.The dumpling can be fried or steamed. The steamed version, called Ukdiche Modak, is eaten hot with ghee. 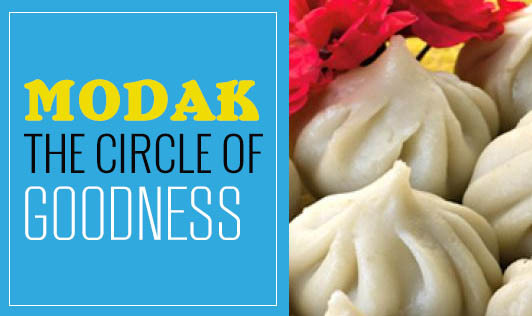 Modak is derived from 'Moda' which means Bliss and 'Ka' which means a small part. So, modak is a small part of bliss. A modak is shaped like a coconut, it is like the cavity 'kha' in the Brahmarandhra, the dwelling house of the soul. It symbolizes spiritual knowledge (dnyan) and hence is also called dnyanmodak. Here are some of the ingredients used in modak and the benefits they offer. Ghee is rich in butyric acid, a type of short-chain fatty acid. It helps relieve gastric ulcers and constipation, and strengthens the immune system. In Ayurveda, ghee is considered one of the most satvic foods. It has been known to promote positivity, growth and expansion of consciousness. It is also known to help build ojas or physical and mental strength and stability. Ghee helps you de-stress, sleep better, and wake up fresher. The positive effects of ghee can be attributed to the fact that it comes freely from cows. Cows are considered special and holy because they receive and store thousands of spiritual energies from the environment. Ghee has powerful antioxidants, selenium, and vitamin E which keep your skin healthy and naturally reduces symptoms of ageing. Ghee reduces sugar cravings and reduces hunger pangs. It increases fat burning, helps mobilize fats from stubborn areas of the body due to its unique chemical structure. Essential fat in ghee has a wide range of functions, including hormone production, secretion of digestive juices, vitamin D production, and lubrication of joints. Vitamin K2 present in ghee helps build lean body mass and improve bone mineral density. Coconut provides instant energy, is nourishing and easy to digest so it's highly beneficial for a host of clinical conditions like hyperacidity, weakness, fever, pregnancy, and is good for lactating mothers too. Coconut is also called as shree-fal (God’s Fruit). The breaking of coconut symbolizes the breaking up of our ego. Lauric acid present in coconut provides anti-fungal and antibacterial effects. White rice helps boost the intake of zinc, an essential mineral which supports reproductive health, boosts metabolism, strengthens the immune system . In Indian rice has for centuries symbolized fertility, health, and wealth. It has been used as an ingredient in worship, as akshad for several auspicious Hindu ceremonies, as well as “shraddha” for funerals. Also associated to a “good night’s sleep”, rice is easily digestible and is best during sickness and disease recovery period. In Japan the words rice and meal mean the same. And Japan is known to have the highest longevity rates in the world. Manganese from rice activates a number of proteins needed for cell function. It allows your body to derive energy from nutrients, boosts collagen production to support wound healing, and acts as an antioxidant to prevent cell damage. The essential amino acid methionine, found predominantly in rice helps mobilize fat from the liver. Vitamin B6 present in rice helps to boost memory, stabilize mood, and aid in easy digestion. Rice is non-allergenic and is naturally gluten-free. Cardamom or elaichi improves digestion, reduces acidity, and flatulence. Cardamom provides a strong aroma and flavor, cleanses the body, and calms the mind and nerves. It improves blood circulation, stabilizes mood, and freshens the breath. It is also used to treat and cure sore throat, tooth and gum infection. It is has good antioxidant properties (limonene). Sugar energizes the body and helps carry out basic functions, including aiding in brain activity. The lack of sugar results in the body using protein for energy. Considered to be part of the panchamrit, sugar is an integral part of staple Indian desserts. In many parts of the world, where malnutrition prevails, sugar is valued as an inexpensive source of energy. It is also a natural preservative. Adding sugar improves taste and palatability. Jaggery is a great digestive aid. It helps treat cough, bloating, water retention, and migraine. This natural sweetener is a store house of nutrients like magnesium, zinc, iron, and selenium. In certain religious ceremonies and rituals, jaggery is offered to local gods and goddesses. Among certain sects of Hindus, it is customary to take a bite of jaggery after attending a funeral. Most traditional recipes in India also use jaggery to prepare sweet dishes. Consuming jaggery regularly prevents iron deficiency anemia. Modak shaped liked a coconut thus attracts and imbibes the difficulties and distress due to the negative energies of its devotees. In Hinduism, it is believed that Ganesha eats the modak, meaning, he eliminates these difficulties and negative energies hence called “Vignaharta”. In terms of nutrition value, it makes for an extremely wholesome and nutritionally-balanced meal. The combination of rice, coconut, and jaggery and the process of steaming used in cooking make it an easily digestible food item to have during the monsoon season, the time when most of us crib about our weak digestive system and bad tummy. Modaks are naturally gluten- and lactose-free, cost-effective, healthy, and unprocessed. Hence muffins, cookies, and biscuits should be substituted with the “goodness of modaks”. 1) Diabetic cannot eat Modak. There are no “off limits” OR “restricted foods” for people with diabetes. Focus on making meals more wholesome and indulgent during special occasions. Sugar in the visible form can be taken in tea, coffee, and homemade Indian sweets but, when taken in invisible form such as in biscuits and cakes can pose health issues. 2) Modak has too many calories and is fattening. One does not lose weight or become healthy by counting calories. The key is to look beyond calories. As part of a healthy meal plan, empty calories (those without real food value) should be avoided. Modak, on the other hand is nutritionally-balanced, rich in several nutrients and minerals (as explained above), and moreover, gives you a boost of energy and vitality. Food that is pure, full of prana, and when prepared with so much love and good healing vibrations gives you much more than just a feeling of satisfaction to your taste buds. It nourishes your body, mind, senses, and soul while increasing positive thinking, creativity, and longevity. 3) Modak is high in cholesterol. The essential fats in ghee is put to good use when consumed by the body. Ghee is metabolized differently from other fats, and it helps to mobilize fat, increase lipid metabolism, and in turn reduce cholesterol. The filling also contains coconut and rice (for the outer covering), jaggery, and spices which makes modaks wholesome and rich in vitamins A, B, E, D, and K, minerals like selenium, zinc, potassium, and magnesium that contribute to health and wellbeing.